A spectacular view over looking the Gulf of Mexico to the west and the Inter Coastal Water way to the north. A typical late 70’s condo with a small kitchen seperated by a wall from a million dollar view. The wall was removed and utilities were rerouted which exposed the world to the kitchen. 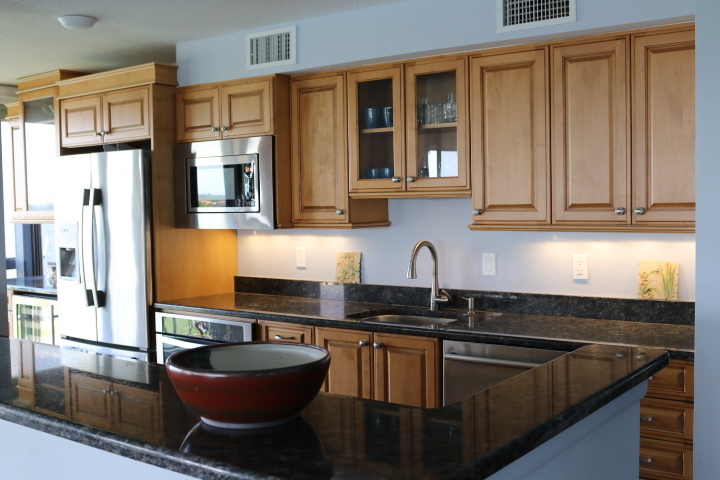 The layout was redesigned with efficient and beautiful cabinets and now has more storage than before. As with most condos from that era, each room was iluminated by table lamps and maybe a swag chandelier. The ceilings were modified to accommodate LED lighting that now offers complete coverage of light with soft dimmable lighting.